Circular knitting (also known as knitting in the round) has benefits over knitting with straight needles, including seamless finished projects, easy portability, and not having to turn your work. Many crafters are intimidated by circular knitting?but you needn't be! 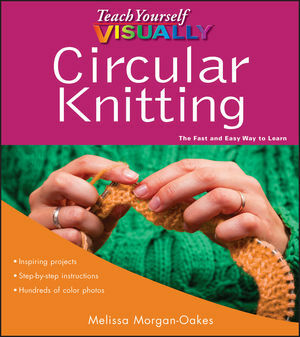 Teach Yourself VISUALLY Circular Knitting walks you step-by-step through the process of circular knitting and shows you how to make a dozen unique projects to put your newfound skills to practice. If you're a crafter who learns better by seeing and doing, Teach Yourself VISUALLY Circular Knitting will get you confidently knitting in the round in no time. Melissa Morgan-Oakes is a knitting instructor, pattern designer, and author of 2-at-a-Time Socks and Toe-Up 2-at-a-Time Socks. She sells self-published patterns through her company Melissaknits, and travels around the country visiting yarn shops and teaching knitting techniques to eager audiences. CHAPTER 1 Introduction to Circular Knitting. The Pros and Cons of Knitting in the Round. The Best Yarn to Use While Learning. Other Tools You Will Need. CHAPTER 2 Circular Knitting Methods. Cast On for Circular Knitting. Work with One Circular Needle: Traditional Method. Work with One Long Circular Needle: Magic Loop Method. Work with Two Circular Needles. Bind Off in the Round. Summary of Circular Knitting Methods. CHAPTER 3 Special Techniques for Circular Knitting. Join Yarn When Knitting in the Round. Work Charts in the Round. Work with Color in the Round. CHAPTER 5 Planning a Project. Select Yarn for a Project. Basic Socks, Kids to Adults. Infant's Cardigan, Hat, and Booties.